Don’t wait until the first stretch of official summer weather to start enjoying your backyard! Homeowners on Cape Cod use gas-fired patio heaters to start the season early and keep warm when evenings get chilly. Once you add a patio heater from Breakaway to your home, you can extend outdoor entertaining season to spring and autumn, too! Stop by our stores in Mashpee and South Dennis, MA to browse the variety of quality patio heaters that we have in stock. If you are looking for recommendations, our friendly staff will be happy to assist you. Don’t see the product you were looking for? We always do our best to order items for customers through our reliable distributors. You can also inquire about patio heaters from Breakaway by calling (508) 398-3831 or contacting us here. Fire pits are a great way to add ambiance to your backyard, but they can’t provide centralized heat that will keep guests completely comfortable. This is where the patio heater comes in. Breakaway is pleased to offer a variety of patio heater sizes from top brands like The AZ Patio Heaters Corporation. So, why add a patio heater to your Cape Cod home? Powered by propane, patio heaters burn cleanly and emit no smoke or fumes into the air. Patio heaters are designed to move. From the outdoor dining space to your favorite Adirondack chairs, you can easily transport your heater across the yard. Gas-fired patio heaters operate on a closed system, so you don’t have to worry about safety and open flames. 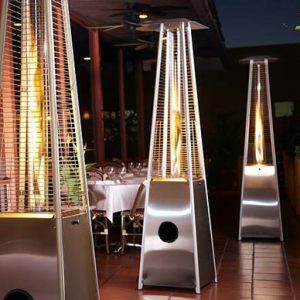 Patio heaters come in a range of sizes and styles to accent any taste. Outdoor patio heaters from Breakaway are powered by propane gas tanks. This means you don’t have to worry about wood, dust, or intensive cleanup. Simply hook up your propane tank and switch on your heater. Best of all, these propane tanks are just like those that power your gas grill! Patio heaters are available for purchase at both Breakaway store locations in South Dennis and Mashpee, MA. Stop by one of the stores to browse the current selection of patio heaters! Our knowledgeable staff is available to help you select the right product for your home and budget. If you don’t see what you are looking for, our team will be happy to try and order the model you are searching for.